I would wholeheartedly recommend this audio drama to anyone who is remotely interested in Phantom of the Opera or horror in general. 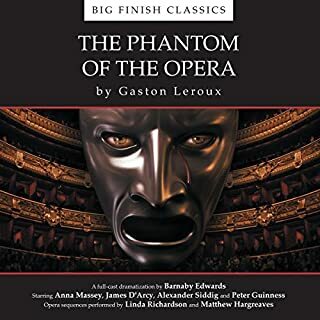 This version of the classic story, "The Phantom of the Opera" is a full cast audio drama made by Big Finish productions. Meaning, it is not simply an audio book but features a full cast similarly to a radio play. This version is simply the most accurate adaptation of Gaston Leroux's novel ever. And trust me, I own 22 other versions. It's worth noting... this is based off the original novel. Thus, it is less romantic than the Andrew Lloyd Webber version most people are familiar with. That being said, it is still a masterpiece. What was one of the most memorable moments of The Phantom of the Opera (Dramatized)? Without spoiling it for those who have not heard the original tale, this audio drama version features the final, heart wrenching monologue of Erik (the Phantom) from the novel which has very very rarely been adapted and has never been on screen I do not believe. The entire cast was perfectly suited, but the Phantom in particular I thought was absolutely perfect, one of my favorite actors in the role. His voice sounds creepy and yet elegant, as Erik should.